One week ago, predictions were made. Some with certainty, others with doubt, and in some cases, I am sure, with a rooting interest for your favorite team. There were questions about teams and players and only one way to find answers; watch the games and see the outcomes. After all, the games provide the entertainment and the resulting joy or disappointment, depending on your vantage point. The outcomes determine the victors and the vanquished and the playoffs, at times cruelly and harshly, clearly separate the two. 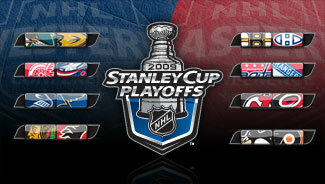 What answers have been obtained through the early part of the playoffs? * St. Louis had a wonderful run to the playoffs, but had the misfortune of facing a team which had an equally good record entering the playoffs. * Roberto Luongo has been on top of his game, and a fortune could be made if there was a dollar handed out at every mention of "goaltending is important in the playoffs." * The Canucks' defense is outstanding and any questions about the Sedin twins have been emphatically answered during the first round with their stellar play. * The future remains bright in St. Louis and while the experiences may be painful, they will also prove to be helpful. * Chris "OsGreat" has warranted the belief the Red Wings put in him prior to the playoffs. The series has unfolded as a lopsided one, but early in Game 1, the Blue Jackets put the test to the Red Wings, and Osgood not only answered brilliantly, he has maintained that level of play through three games. * The Blue Jackets are playing the "big dogs" and it is a lesson they can only hope will benefit them in the future. * The Sharks may have been following along to the words of the song, Californication by the Red Hot Chilli Peppers; "Destruction leads to a very rough road but it also breeds creation." Losing the first two games of their series to Ducks on home ice didn't raise any new questions, but only intensified the ones which have been asked so many times over the past few years about the Sharks. * Rob Blake and Dan Boyle may be the answers the Sharks have been seeking, and if their performances in Game 3 are any indication, this series is destined to play out as a classic. * Youth versus experience. Bright future versus the future is now. Chicago versus Calgary. The answers have not been obvious, but rather revealing. The Hawks have a leader in Jonathan Toews, who relishes a challenge and he has shown a savvy belying his age. With a player out front meeting the challenges posed by the Flames, and allowing confidence to build throughout the team, the Hawks can feel confident in their opportunity this season and excited about what lies ahead. * Sacre Bleu! The lament of Habs' fans everywhere can be heard loudly. The centennial anniversary will not produce the Stanley Cup hoped for, but for it to come at the expense of their storied rival and adversary, the Boston Bruins, only makes the disappointment bitterer. * The hub of championships in professional sport and in NCAA hockey is Boston and the Bruins look extremely capable of adding their own championship trophy to the mantle. * The playoffs always produce challenges for teams and individuals. How quickly the challenges facing the Rangers were turned around and put on to the Capitals. There were no questions surrounding Henrik Lundqvist entering the playoffs and the Capitals may have found their own answer to their goaltending questions in Simeon Varlamov. It is a not a time for the faint of heart or those who may be reluctant to make necessary changes. Bruce Boudreau has shown the courage of a lion and the nerves of steel in trusting the Stanley Cup aspirations to his young goaltender. * Martin Brodeur and Cam Ward are Stanley Cup champions and the quest to lead their respective teams to another contributes to a drama that shows the potential of playing out to the very end and even into extra time. The back and forth of two teams determined to win has provided one answer after four games; there is no clear indication of who will win this series and being ahead or being behind in a game does not allow any comfort of control. One of the best series to date and it will only get better. * It is not so much the experience that helps, but rather what one has learned from their experience. The Penguins have taken the lessons of both 2007 and 2008 and are applying them to their best advantage. They are were the NHL's best team during the last 20 games of the regular season and look both determined and capable of giving themselves the opportunity to compete for the club's third Stanley Cup. * The question that begs to be asked of the Flyers is; at what point do they want to focus more on disciplined and aggressive play rather than on the undisciplined and senseless which has provided ample opportunity for the Penguins to take advantage? The playoffs will always provide the burning questions and whether a team is victorious or on the losing side, answers will always be forthcoming whether one wants to hear them or not.